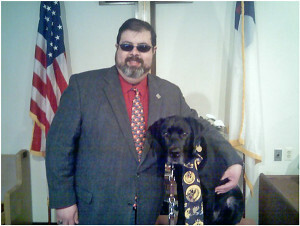 Pastor Darryl Miller and his leader dog, Rowdy. In early January, we did a story about Pastor Darryl Miller and his leader dog, Rowdy. Miller, who is legally blind, is pastor at both South Ensley United Methodist Church and Sand Lake United Methodist. Rowdy, an 11-year-old black lab who was Miller’s faithful companion and seeing eye dog, needed surgery to fix a fistula—a hole in the roof of his mouth—and the Sand Lake United Methodist women was holding a fundraising event on January 14 to help pay the mounting medical bills. He had already undergone five surgeries, but the hole had not healed due to an infection in his jawbone. Once they discovered it, he was put on antibiotics, and they hoped the next surgery would help the dog to finally heal. Unfortunately, Rowdy did not survive the surgery, and died on January 30. Rowdy was trained at the Leader dog school in Rochester, Michigan—a school founded by the Lions Club, and that’s where Miller will apply for another dog. There is no charge for the guide dog. Miller is grateful to all those who have supported him during this time. “Thank you so much for all your prayers and donations for my Leader Dog Rowdy. My family and I along with our church families want to thank you for your love and help,” he said.